It took barely 12 hours for the 25th Congressional District election to pivot from the Democratic primary to the coming general election in November. 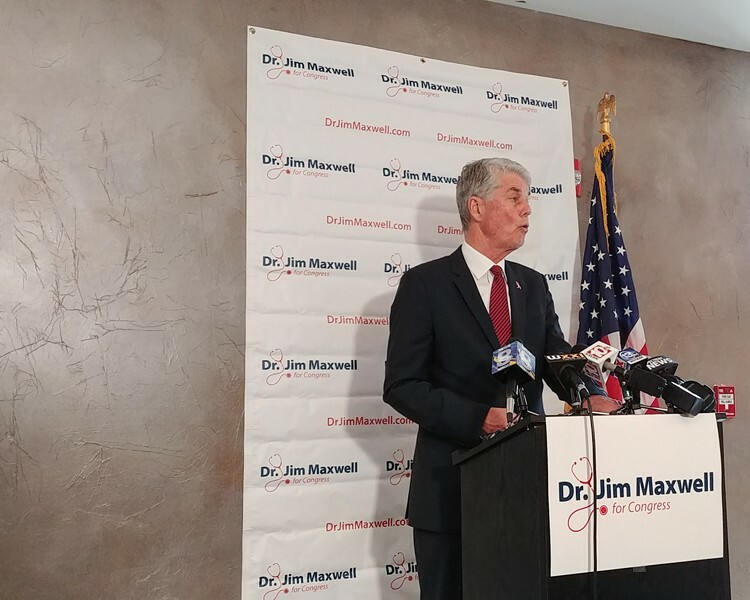 Assembly Majority Leader Joe Morelle walked away with a victory in last night's primary, and this morning his Republican opponent Jim Maxwell, a neurosurgeon from East Rochester, held a press conference at City Grill on East Avenue to sketch out his campaign platform. Jim Maxwell, the Republican candidate for the late Louise Slaughter's House seat, speaks during a press conference this morning. "I am a Republican," Maxwell said at one point. "I was born a Republican." Throughout his remarks, he positioned himself as a candidate in the mold of Barber Conable or James Walsh, Republicans who at one point represented parts of Greater Rochester in the House. He said "it's no secret that Congress is broken" and criticized extreme partisanship, while stressing the need for civility, compassion, and compromise. He cast Morelle as a career politician who's associated with former Assembly Speaker Sheldon Silver, former New York Attorney General Eric Schneiderman, and former New York Attorney General and Governor Eliot Spitzer, all of whom left office under a cloud of scandal. Using one liners like "Nobody ever called my operating room a swamp," Maxwell cast himself as a fresh face with no political baggage. He's an independent guy who won't just toe the party line, he said. As for actual positions, Maxwell elaborated on only a few. He said that like the late Louise Slaughter, the Democrat who held the seat since 1987, he has an appreciation for science and research. And he specifically said he wants to see more cancer research funding directed to Monroe County. He also said he's "a staunch supporter of the #metoo movement" and that he wants to advocate for equal pay, family leave, and pre-kindergarten programs. He was silent on reproductive rights. He said he agrees with a recent Supreme Court decision that upheld the authority of President Donald Trump to limit immigration from certain countries. The president's hands shouldn't be tied when it comes to protecting Americans' safety, he said. But people should not be targeted on the basis of religion, ethnicity, or sexual orientation, he said. The federal tax reform passed by Republicans in Congress is a step in the right direction, he said, although the final legislation, he added, was "far from perfect." He promised common-sense representation on taxes, regulation, and spending. On health care, it's likely Maxwell's not a fan of single-payer concepts such as Medicare for All. Health care is too expensive, he said, and he favors a "patient-centered system" that lowers costs and keeps decision-making in the hands of doctors and patients, not "between Washington bureaucrats." He also wants to see expanded access to health care for people who can't currently afford it. But he used language around health care that Republicans typically use to push back on government-enabled universal-care approaches, especially single-payer, without actually directly invoking them.